The visit sends a clear message that the White House is not an ally against graft but a friend of kleptocracy. Malaysia’s Prime Minister Najib Razak meeting with President Donald Trump today is the first White House visit by a Malaysian head of state since George W. Bush’s first term in office. But while we will hear more about the actual deliverables from the visit, for many Malaysians, including Najib himself, the most important outcome of the meeting has nothing to do with questions of bilateral policy. Rather, the most significant consequence of the Trump-Najib summit will be to burnish Najib’s reputation while being under active investigation by the U.S. Department of Justice. For more than two years, Prime Minister Najib has been seeking to contain the fallout from one of the largest corruption scandals in modern history: the theft of billions of dollars from 1MDB, an economic development fund administered by the Malaysian government. 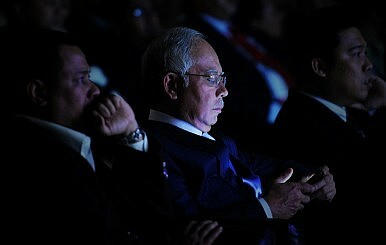 Of these billions, around $700 million reportedly found its way into Najib’s own bank accounts. Yet, despite widespread outrage, Najib has deftly used at times draconian legal and administrative instruments to weather the fallout, including a disturbing crackdown on free speech and other civil liberties. Many Malaysians who take a dim view of Najib’s autocratic drift have placed their hopes in external actors to expose the corruption at the heart of Malaysian politics. Multiple national law enforcement agencies are currently investigating the 1MDB scandal, including the United States Department of Justice, which last year filed a civil forfeiture complaint seeking recovery of $1 billion in stolen 1MDB assets laundered through U.S. financial institutions, and is simultaneously conducting a criminal investigation. DOJ’s inquiry has independently concluded that the funds in Najib’s bank accounts were from 1MDB, and not a Saudi donor as Najib has vowed, although the department has not brought charges against Najib to date. Trump has not spoken publicly about 1MDB or the DOJ investigation, but his ties with Najib predate his presidential campaign, and his decision to receive the Malaysian leader at the White House sends a demoralizing signal to those in Malaysia and across the world who want the United States to stand up for democracy and fight corruption. There has been widespread speculation among Malaysians that Najib will persuade Trump to intervene on his behalf and ensure the DOJ probe does not personally target him or his assets. Although such interference seems unlikely, it is not unimaginable in light of the president’s documented efforts to tamper with law enforcement activities, such as his firing of FBI Director James Comey, and his request to aides that DOJ drop its prosecution of Sheriff Joe Arpaio (whom Trump later pardoned). This apprehension that Trump will seek to spare Najib reflects a widespread belief internationally that President Trump will conduct foreign affairs into a wholly transactional fashion with little regard for human rights, democracy, or rule of law. In our conversations with Southeast Asian elites since last November’s presidential election, we have found many were favorably disposed towards Trump – but for all the wrong reasons. There is a pervasive sense among business and political leaders in the region that the rules of the game have changed and everything is now flexible. In many ways, Southeast Asian leaders like Najib see in Trump an image of themselves – a leader whose instincts favor political survival over institutions and rule of law. While Najib’s visit this week will no doubt provide ballast to U.S.-Malaysia relations in the near term, whether it serves the relationship well in the long run is a different matter. At a minimum, the visit sends a clear message that the White House should no longer be viewed as an ally in the fight against graft, but rather a friend of kleptocracy. Even if the two leaders avoid the subject of 1MDB, the meeting will be a major victory for Najib and his administration both in Malaysia and on the world stage. On the U.S. side, the visit will mark another chapter in the Trump Administration’s dangerous indifference to foreign corruption. Southeast Asia remains a strategically important region for the United States, and the White House is right to seek to engage Southeast Asian leaders. Yet that engagement should not involve turning blind eye to graft, authoritarianism and repression. As Trump plans to welcome autocratic leaders from Thailand and the Philippines to the White House later this year, at some point one must ask whether U.S. policy towards Southeast Asia is guided by any broader values or strategic vision. For the moment, the answer to this question is completely unclear, and marginalized democrats across the region are taking note. Trevor Sutton is a fellow for National Security and International Policy at the Center for American Progress (CAP). Brian Harding is director of East and Southeast Asia policy for National Security and International Policy at CAP.